After Theresa May lost her majority in parliament on June 8 with a failed gamble on a snap election, she tried to secure the backing of the small Democratic Unionist Party (DUP) and its 10 lawmakers, though talks had dragged on for more than two weeks. British Prime Minister Theresa May struck a deal today to prop up her minority government with the support of a small Northern Irish Protestant party. After May lost her majority in parliament on June 8 with a failed gamble on a snap election, she tried to secure the backing of the small Democratic Unionist Party (DUP) and its 10 lawmakers, though talks had dragged on for more than two weeks. 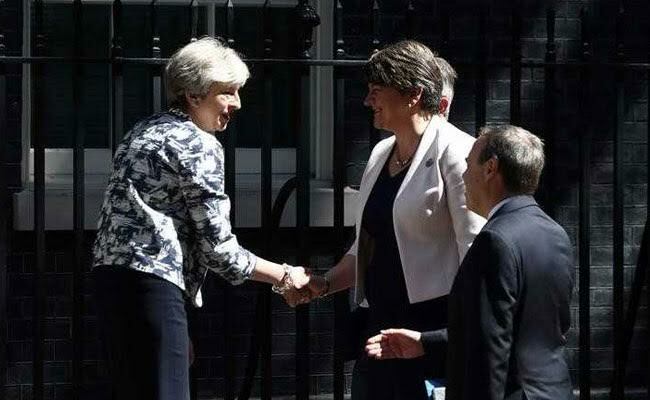 May and DUP leader Arlene Foster presided at the signing of a deal at Downing Street today. They smiled and joked as negotiators from both sides, the DUP's Jeffrey Donaldson and the Conservatives' Gavin Williamson signed the deal. The details of the deal were not immediately released. A deal would allow May to pass legislation with the backing of the DUP in the 650-seat parliament, and stay in power as she attempts to negotiate Britain's exit from the European Union. "I think that this agreement will bring the prospects of doing a deal at (the Belfast parliament) Stormont closer because this will have a positive impact in relation to Northern Ireland," Foster told Sky earlier, adding that a second deal on power sharing in the province could be reached this week too. "I very much hope that this week we will be able to conclude on two agreements."